With spring in full swing, it’s time to make sure that your Porsche is ready to handle the roads of Chesterfield this summer. While we are sure that you have been performing regular maintenance checks on your Porsche all winter long, we here at Kudos Import And Performance want to help you make sure that your Porsche is in perfect working condition. 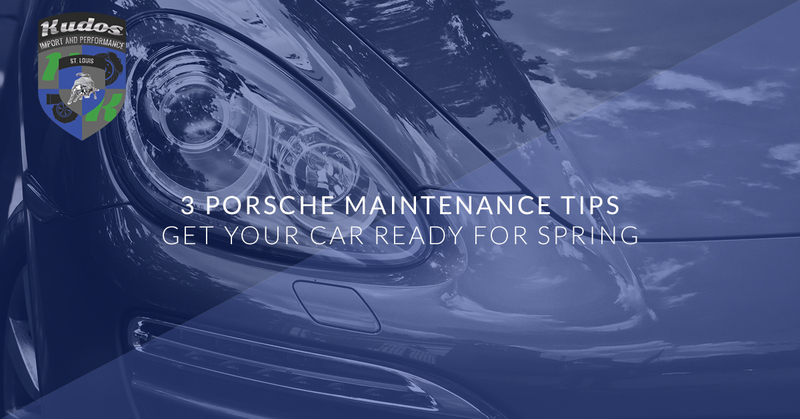 In part one of a two-part blog series, we are going to cover some essential spring maintenance tips that you need to perform to ensure that your Porsche is running as optimally as possible. Continue reading below to learn more. When it comes to your Porsche, we’re sure that you only want what is best for your vehicle. A Porsche is a finely tuned automotive machine that, like all machines, eventually needs some maintenance. This maintenance is typically not that involved, however, if you skip it repeatedly, there could be some serious consequences down the road. Below, we have listed a few of the steps you need to take to ensure that your Porsche is ready for the warm weather. Check Fluids: The first thing you want to do to make sure that your Porsche is ready to go is to check all of the fluid levels of the vehicle and make adjustments to them based on what you find. The most important fluid to check is your Porsche’s oil level. If the oil level is low or it has been a while since you have had the oil changed in your vehicle, now would be a great time to go ahead and get it changed. In addition, make sure to keep an eye on power steering fluid and transmission fluid levels. If either of these fluids runs too low, costly repairs could be a result. Check the Battery: While most of the time you will be aware if there is an issue with the battery, it’s also a good idea to check it as part of a spring maintenance checklist. Cold, especially prolonged cold such as we experience in the winter, can wreak havoc on your Porsche’s battery, sapping power levels and leaving it unable to hold a charge. If you do not have the equipment to test your own battery, call us today at Kudos Import and Performance and lets us take a look at it. Trust us, you’d rather know about a battery issue now than figure out something is wrong when you’re 100 miles away from home. Check the Electrical System: Your battery isn’t the only important part of your Porsche’s electrical system. When performing your spring checklist make sure to take the time to check your vehicle’s connections, as well as spark plugs, belts, and hoses. Belt replacements are one of the most common reasons that people visit us at Kudos Import and Performance, so keep an eye on these temperamental automobile accessories. Join us again next time as we continue to go over some of the essential steps you need to take to ensure that your Porsche is ready this spring. And, as always, if you would like to schedule a maintenance check for your vehicle, contact the experts at Kudos Import and Performance. We have years of experience helping Chesterfield area residents with all of their import performance needs and we would love to be able to help you as well.